Boothby’s Orchard is quickly becoming known for more than great apples and a memorable pick-your-own afternoon. 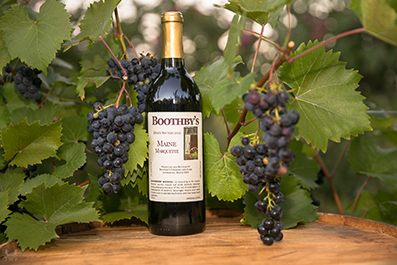 A new line of fruit wines is grabbing regional attention. It’s no secret that New England family farms, especially dairy farms, have faced serious challenges in recent decades, forcing many difficult kitchen-table decisions. When the Boothby farm sold the last of its dairy herd in 2001, it left the old milk room vacant. It became the perfect spot for a winery. So out went the 1,200 gallon, stainless steel milk tank and in moved the oak barrels and other wine-making equipment. It took years of testing and tasting, testing and tasting (hard work, but somebody needed to do it!) before they felt they had a wine worth sharing. Now you can pick up several varieties at the farm stand, and soon we hope to be distributing around the state and beyond. 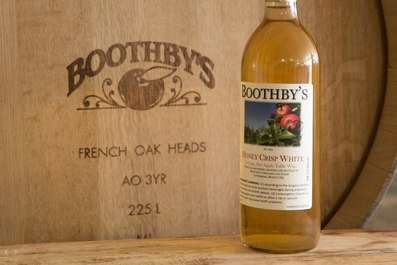 Each bottle carries a distinctive label, the proud heritage and the new traditions on Boothby’s Orchard and Winery. Our wines are available for shipping through Vinoshipper. Aged in Appalachian Oak barrels, the smokiness compliments our prized Honey Crisp apples in this sophisticated varietal. Try this one on the rocks! Our house wine. A blend of favorite cider and heirloom apples. Fuller bodied, lightly oaked and fruit forward. 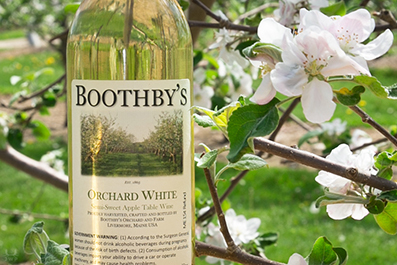 Our fan-favorite and best seller is a subtly sweet, apple wine. Wonderful on its own or with light savory fare. Our estate red grape wine. Grown, fermented and barrel-aged in American Oak with French heads on our farm. 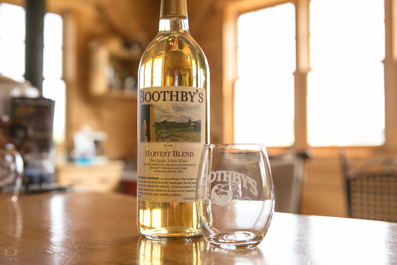 Medium bodied with smooth acidity, wonderful nose and an earthy expression of our homestead.